As part of the Sustainable Living Plan, Unilever is leveraging its expertise in business and social impact as part of its brightFuture platform. The platform aims to help build a world where everyone lives sustainably by working together to make a difference against pressing issues such as hunger – and they’re doing this by building the foundation for healthy living and eating among local communities. Unilever has directly donated to Building Healthy Communities, a partnership between the Mayor’s Office of Strategic Partnerships and the Fund for Public Health in NYC. This initiative aims to increase access to fresh food, advocate for more physical activity, and promote safe and vibrant public spaces throughout the City. Lessons and best practices from the program in NYC’s Harlem neighborhood will be used to customize programming in six more markets across the country. Join 3BL Media (@3BLMedia) as we moderate a LIVE Twitter chat discussion with Unilever (@UnileverUSA), New York City Mayor’s Office (@NYCMayorsFund) and Green City Force (@GreenCityForce). 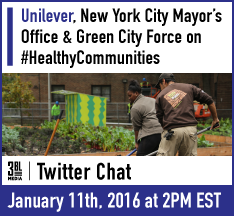 Please use #HealthyCommunities to join in and be a part of this LIVE discussion. Follow the main participants and #HealthyCommunities hashtag. Submit questions before the event to get the discussion going early! Use the #HealthyCommunities hashtag on your comments that you want to share with the community. Tracy Shepard-Rashkin has been a marketer at Unilever for 4 years and currently manages multi-brand initiatives across Unilever’s portfolio of food and refreshment brands, among them Hellmann’s mayonnaise, Country Crock and I Can’t Believe It’s Not Butter spreads, Knorr, Lipton tea, and Breyer’s ice cream. Among these initiatives are programs aimed at improving the health and wellbeing of underserved communities through access to fresh food and healthy cooking education. Prior to Unilever, Tracy was a conservation organizer at the Sierra Club and received her MBA at the Yale School of Management. Gabrielle Fialkoff has served as Senior Advisor to the Mayor of New York City, Bill de Blasio, since March 2014. In that post, she serves as the Director of the Mayor’s Office of Strategic Partnerships, overseeing the City’s many city-affiliated non-profits including The Mayor’s Fund to Advance New York City, the Fund for Public Schools, the Fund for Public Health, the Fund for Public Housing and the Gracie Mansion Conservancy, as well as serving as a principal liaison to the business community for the Administration. Fialkoff currently serves as Vice Chair of the Mayor’s Fund to Advance New York City, as the Mayor’s appointee to the Board of the Museum of Modern Art, and is involved in several charitable organizations. Fialkoff formerly sat on the Board of the Accessories Council, a not-for-profit, national advocacy organization established to stimulate consumer awareness and demand for fashion accessory products and the Board of the Fashion Jewelry and Accessories Trade Association (FJATA). Fialkoff holds a degree in History and Political Science from Colgate University and resides in New York City with her family. Lisbeth Shepherd founded Green City Force (GCF) in 2009 to address the dual imperatives of urban youth unemployment and climate change through service. GCF leverages national service to create pathways to careers for unemployed young adults residing in public housing, while engaging them to address city climate action goals. Named "NYC’s Most Innovative Nonprofit" by Mayor Michael Bloomberg in 2013, GCF has engaged over 300 young adults with an 80% graduation rate and 80% placement rate in employment or college. GCF coated or cleaned over 1 million square feet of rooftop with the NYC ˚CoolRoofs campaign, built New York City's first urban farm in public housing with the New York City Housing Authority (NYCHA) and Added Value, and educated thousands of public housing residents about changing energy consumption behaviors in their homes, through the Love Where You Live Challenge, created and implemented by GCF's corps. GCF is a White House Youth Jobs+ Champions of Change; has been hailed as a national model by President Clinton and by General Stanley McChrystal; and in 2014 was honored with awards by both Environmental Advocates of New York and the New York City Council. From 2007-8, Lisbeth chaired the national Clean Energy Corps Working Group at Green for All where she worked with Van Jones and leaders in the green jobs movement from around the country on a policy proposal for a national Clean Energy Corps. Lisbeth previously founded Unis-Cité, the leading national youth service program in France which engages over 2,000 annual corps members in 50 cities and inspired national legislation affecting 75,000 young adults. She is an Echoing Green and Draper Richards Kaplan alum, New Profit Inc. Accelerator Entrepreneur, Audubon “Woman Greening the City,” Yale graduate and mother of two. The Fund for Public Health in NYC incubates innovative public health initiatives that lead to improved health for all New Yorkers. Since its founding in 2002, the Fund has raised more than $400 million in public and private funding for nearly 300 grants to support programs developed with the Health Department. The Fund for Public Health in NYC is an independent, nonprofit organization that connects the NYC Health Department with public and private sector partners to build public health programs that make NYC healthier and safer. Unilever is one of the world’s leading suppliers of Food, Home and Personal Care products with sales in over 190 countries and reaching 2 billion consumers a day. It has 169,000 employees and generated sales of €53.3 billion in 2015. Over half (58%) of the company’s footprint is in developing and emerging markets. Unilever has more than 400 brands found in homes around the world, including Persil, Dove, Knorr, Domestos, Hellmann’s, Lipton, Wall’s, PG Tips, Ben & Jerry’s, Marmite, Magnum and Lynx. Unilever was ranked number one in its sector in the 2015 Dow Jones Sustainability Index. In the FTSE4Good Index, it achieved the highest environmental score of 5. It led the list of Global Corporate Sustainability Leaders in the 2015 GlobeScan/SustainAbility annual survey for the fifth year running. Unilever was ranked the most sustainable food and beverage company in Oxfam’s 2016 Behind the Brands Scorecard for the second year.